As well as my weekend visit to Arek’s fruit and vege stand another must-stop is Karapiro Meats for free-range beef, lamb, pork and/or chicken. 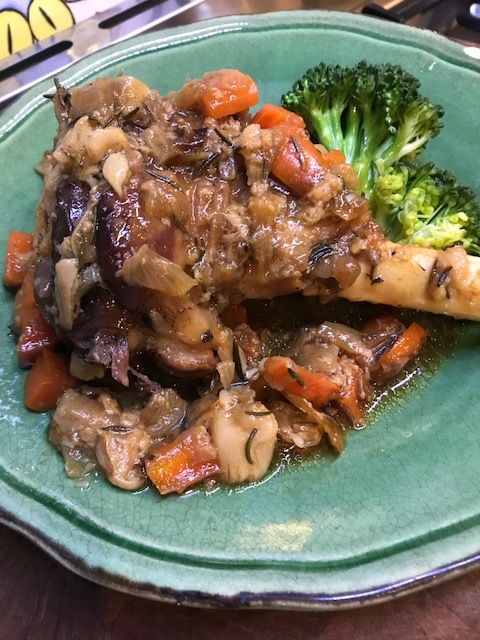 I can never decide what to choose and, although winter has now passed, I bought amongst other things last weekend, lamb shanks. So, I made something which was slow-cooked but very easy and not wintery heavy. The following recipe was only for Mike and I so if you’re cooking for more than two just add more shanks and increase everything else a little – it’s not necessary to double it all for 4 people apart from the shanks. You’ll see it’s simple to do and you only need to allow enough slow cooking time. Season the lamb generously with salt and pepper. Use a flameproof deep oven dish and place the onion wedges, carrot chunks and crushed garlic in the bottom and toss with a little oil. 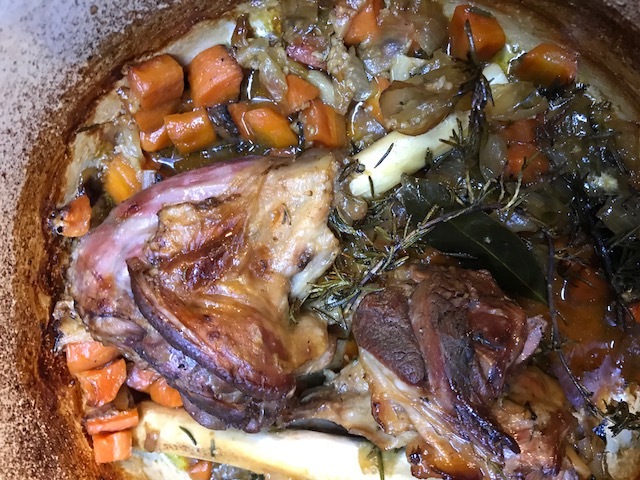 Place the lamb shanks on top and tuck in the halved garlic heads and fresh herbs. Drizzle the lamb and garlic heads with a little more oil. Bake in the oven for 45 minutes checking halfway through. Turn the shanks and give the onions and carrots a bit of a mix. If they begin to burn add a splash of water. After about 45 minutes turn the oven down to 170-180C. Add enough stock and wine so the liquid comes about halfway up the shanks. The garlic heads need to be sticking out of the liquid. Cover the dish tightly with its lid or foil and bake until the shanks are very tender and coming away from the bone. Turn the shanks once or twice and add more liquid if needed. Once ready, take out the shanks, vegetables and squeeze the flesh out of the garlic heads into the remaining liquid. Give the remaining liquid a quick burst of heat on the stove top and stir it well to ensure you have a nice sauce to go over the lamb and vegetables.